Some household cleaners have seemed to be around for ever. Take Soft Scrub for instance, I can remember seeing commercials for it as a child. It was the white creamy cleaner that you could use on your bathroom suite in lieu of a harsher cleaner that would scratch the porcelain. 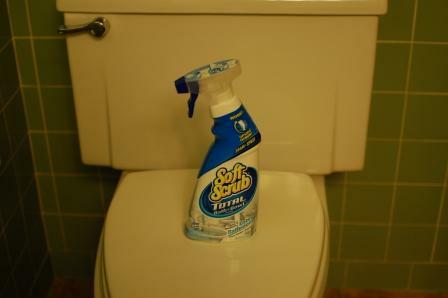 A few changes have occurred to the Soft Scrub product since those commercials from my childhood. Now it also sprays in either a stream or a foam and, my favorite part, it sprays upside down. That means you can reach under the lip of the bowl in the toilet and blast those nasty germs from here to kingdom come. Let's get down to the nitty gritty - literally. What you really want to know is does it work and do I like it? And the answers are yes and sorta. The fragrance of the product is not one that I would tend to choose to have in my house. It did smell clean, but in a Great-Grandmother's bathroom filled with talcum powder and mothballs in the drawers kind of clean. Generally, I tend to go for fresher scents so this was a bit heavy and musky for me. If you would like an opportunity to try Soft Scrub Total, here's your chance. The good folks at Soft Scrub have given me coupons for FREE bottles of Soft Scrub to give away to three readers. All you have to do is participate in the rafflecopter below. Please leave an e-mail address for me to contact you if you have won. Winners will have until October 5th to respond or a new winner will be drawn. Soft Scrub also has a Tough & Gentle Sweepstakes going. There is a $1,000 grand prize and fifty 2nd place winners will each receive $40 in gift cards. Thanks to all who entered! The winners have been contacted. I was sent a bottle of Soft Scrub Bath & Bowl to review. All opinions and pictures of toilets are my own. Thanks Soft Scrub! I generally prefer a "streaming" cleaner except for sinks which I prefer foams. I haven't used Soft Scrub in years and I might try this (mainly for the upside down spraying)! I like the foaming cleaner for my tub but streaming for most other surfaces. I like the foaming. It reminds me of being a kid when the teacher would write our initial in shaving cream on our desk and we would "clean" it off!